Our Bespoke Manufacturing Department uses a mix of the latest C.A.D. -C.A.M. technology processes and the experience of time served operatives to produce flue components in a variety of materials, sizes, shapes, lengths and construction as required. 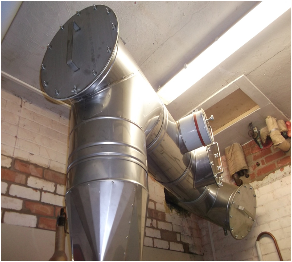 This enables us to produce flue components to the exact dimensions required on site, in particular multi – connection header units. All Project bespoke manufacturing is programmed in tandem with the standard manufacturing processes to eliminate any project delays. 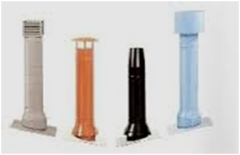 As an option, flue components and systems are available with an external skin finish in B.S. or RAL colours. This allows the external flue to blend into the surroundings or to become an architectural feature. We use the latest Computer Aided Design and manufacturing technology to ensure each component and system conforms to project design drawing and published specification data. Each component is individually manufactured to exact dimensions and configuration and is then checked for quality of product and dimensional accuracy by our Quality Department prior to dispatch. We manufacture a comprehensive range of Flues and products from large Twin-Wall systems to a simple flue support bracket. Our range of Twin Wall and Single Skin Flues are available in a variety of construction types, each designed to suit particular flueing applications. Project Installations and Trade Counter. EN1856-1: 2009 and EN1856-2: 2009. All flue products manufactured by Sigram are CE marked appropriately prior to sale. Sigram to become synonymous with QUALITY FLUES.